We understand that check cashing isn't for everyone. So we came up with a package that will still drive foot traffic and increase revenue without the responisibilities of check cashing. This year we introduced our new Merchant package. With a low up front cost there is no excuse not to offer your customers all of these amazing additional services! Bill Payment: Access to thousands of billers with varying posting times to ensure your customer can make their payment safely, securely, and on time. Prepaid Debit: Sell and reload Netspend cards. Earn commissions for every card sold and every time the customer uses the card. Also earn when a customer reloads their card at your location. Cashing Plastic: Allow customers to unload their debit card and tax refund cards without the restriction of an ATM. MoneyGram*: Your customers can send money domestically and internationally using our integrated MoneyGram service. Bitcoin: New technology allows you to sell Bitcoin to your customer to be loaded to their digital wallet. *PC must meet minimum specs required. Inquire for more information. 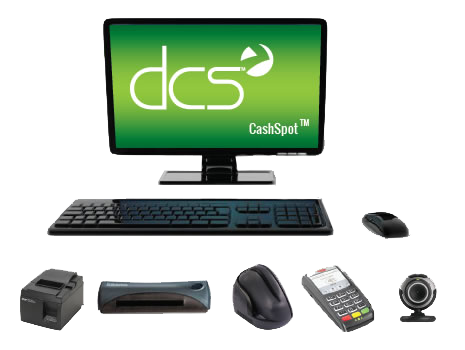 The DCS CashSpot is an all-in one solution ideal for grocers that offers check cashing, bill payment, money orders, money transfers, pre-paid debit cards, phone cards and PINs, and more! All software and hardware included. 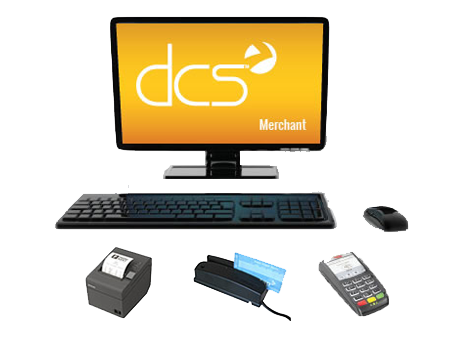 The DCS Merchant package is designed for non MSB merchants that still want to offer financial services to increase revenue. A low cost option that gets a merchant up and running quickly is a sure hit with customers.